Biophilic design is all about observing the world around us and studying how nature resolves everyday problems. And this is exactly what a group of MIT engineers, led by Anette (Peko) Hosoi, have done. 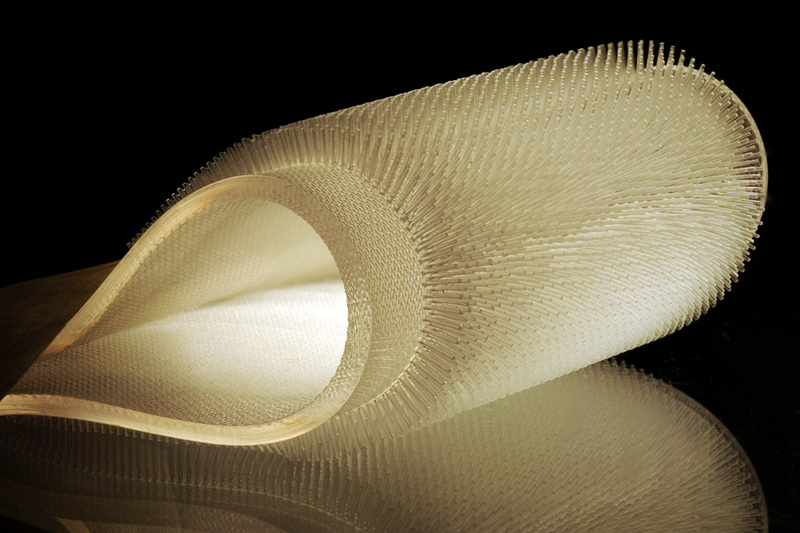 Inspired by semi aquatic mammals like beavers and sea otter they have come up with a rubbery material that imitates the furry layer that insulates them from the cold. Their curiosity was piqued when visiting a wetsuit manufacturer in Taiwan. They wondered if there could be a bio inspired solution for surfers to wear in the water. The results have been published in the journal Physical Review Fluids, with the collaboration of lead author and graduate student Alice Nasto, postdoc José Alvarado, and applied mathematics instructor Pierre-Thomas Brun, all from MIT, as well as former visiting researcher Marianne Regli, and Christophe Clanet, both of École Polytechnique, in France. So how do beavers and sea otter keep warm while swimming in cold waters? Unlike whales and walruses, they don’t have a thick layer of blubber to help them out. Instead, their dense fur traps warm pockets of air allowing them to stay warm, and even dry. Nasto knew that these mammals are covered in two layers of fur. The long, thin “guard” hairs, that act as a shield for shorter, denser “underfur.” Biology had established that the long hairs kept the water from seeping into the underfur, hence trapping the warm air, but there was no mechanical understanding of that process. And this is what Nasto and her colleagues set off to prove. In order to recreate this pocket effect, Nasto and her team made molds out of acrylic blocks that then were filled with a soft casting rubber called PDMS (polydimethylsiloxane). This was done using a variety of sizes and spacing between individual hairs. Once cured, the hairy rubbery results were pulled out. The researchers placed each hairy surface onto a vertical, motorized stage, with the hairs facing outward. They chose silicone oil as the liquid to submerge the surfaces into. As the surfaces were submerged, they observed the relationship between the density of the fur and the speed of the plunge, finding that the higher the density and the higher the speed, the thicker the layer of air within the hairs was. Hosoi and Nasto were then able to reflect this air trapping effect into an exact mathematical term that when applied to the data collected during their experimentation, demonstrated that their predictions were correct. So they now have the capacity to foresee how thick the air trapped under the hairy surface will be.